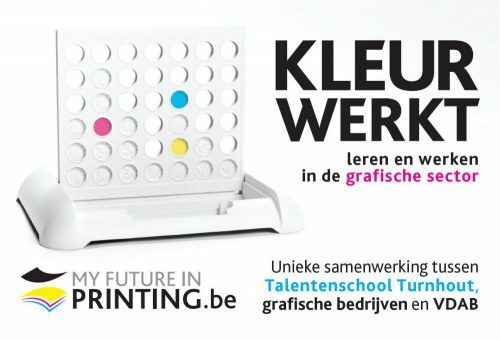 Solidus Solutions Belgium has entered a three-year partnership called “My Future in Printing”, an initiative of Talentenschool Turnhout Campus Zenit to put the profession of printer and printmaker on the map. My Future in Printing is a unique collaboration between graphic companies and the education. At the moment, the printing industry is experiencing a strong ageing, so there is a need for new employees. Therefore, the project aims to double the number of pupils in the graphical departments and to fill vacancies more easily with the participating companies over a period of three years. In addition, the campaign also wants to point out the developments in the sector such as digitization in production processes to make the profession more attractive. The project is also supported by seven other graphic companies from the Turnhout region, the VIGC (Flemish Innovation Center for Graphic Communication), the VDAB (Flemish Service for Employment and Vocational Training) and the graphic sector and training fund GRAFOC. For more information, check https://myfutureinprinting.be/.